San Diego, CA – Renova™ Therapeutics, a biopharmaceutical company developing gene therapy treatments for cardiovascular and metabolic diseases, announced the publication of Phase 2 clinical trial results of AC6 gene transfer for the treatment of patients with heart failure and reduced ejection fraction in The Journal of the American Medical Association (JAMA) Cardiology. This trial was funded via a public-private partnership between the National Institutes of Health’s National Heart, Lung, and Blood Institute and Renova Therapeutics. Results indicate that, through a one-time administration, AC6 gene transfer safely increased heart function beyond optimal heart failure therapy. AC6 gene transfer involves infusing an inactivated adenovirus vector encoding human adenylyl cyclase type 6 (Ad5.hAC6) into the arteries that feed the heart during cardiac catheterization, a commonly performed procedure. Renova Therapeutics will develop AC6 gene transfer as an investigational product known as RT-100. AC6 is a protein found in cardiac muscle cells that regulates heart function and appears to be down-regulated in heart failure patients. Dr. H. Kirk Hammond, Professor of Medicine at the University of California – San Diego and cardiologist at the Veterans Affairs San Diego Healthcare System, and his colleagues developed the method of gene transfer designed to up-regulate AC6 content in the heart, performed extensive preclinical studies and ran the clinical trial. Dr. Hammond is a co-founder of Renova Therapeutics and serves as a consultant to the company. The randomized, double-blind, placebo-controlled trial included 56 patients who were studied for up to one year at seven medical centers throughout the United States. The trial assessed the safety of five doses of Ad5.hAC6 versus placebo in patients with symptomatic heart failure. Forty-two participants received Ad5.hAC6; 14 received a placebo. In addition, symptoms of heart failure were reduced 12 weeks after therapy in Ad5.hAC6 participants (p=0.0005) but not in placebo subjects. After one year of follow-up, one death of 42 (2.4%) in the AC6-treated group and one death of 14 (7.1%) in the placebo group had occurred (p=0.40). The annual heart failure hospital admission rate was 9.5% in the treatment group versus 28.6% in the placebo group (p=0.10). Heart failure afflicts more than 28 million people globally and is the only cardiovascular disease that is increasing in prevalence.1 It is the most common cause for emergency hospital admissions in patients 65 and older. 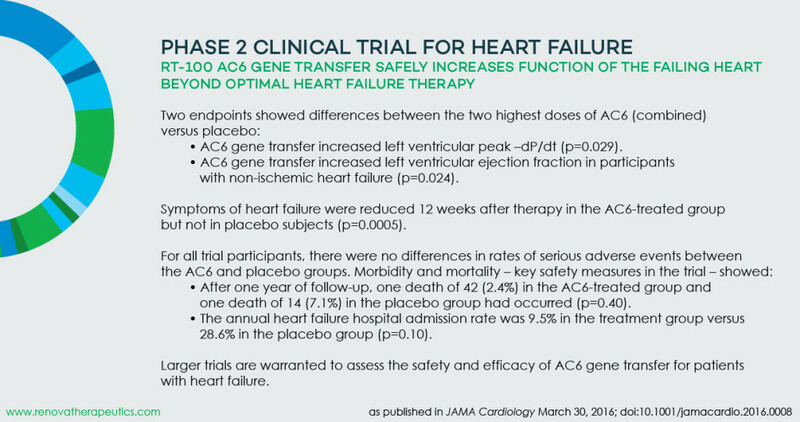 Larger trials are warranted to assess the safety and efficacy of AC6 gene transfer for patients with heart failure. Renova Therapeutics is committed to bringing to market a single-dose treatment to safely increase heart function and looks forward to advancing to pivotal trials for RT-100 AC6 gene transfer. The study results will also be published in the May 2016 print issue of JAMA Cardiology. Renova™ Therapeutics is developing definitive, one-time gene therapy treatments to restore the health of people suffering from chronic diseases. The first two indications the company is pursuing are therapies for congestive heart failure (CHF) and type 2 diabetes, two of the most common and devastating chronic diseases in the world. The company’s lead product, RT-100, is a treatment that delivers a therapeutic gene directly to the heart during a routine outpatient procedure and has the potential to increase heart function in millions of patients with CHF. The company’s product pipeline also includes a second-generation therapy for CHF patients and a groundbreaking therapy in preclinical stage for sufferers of type 2 diabetes. Renova Therapeutics was founded in 2009 and is led by an experienced management team in biopharmaceuticals and gene therapy. For additional information about the company, please visit www.renovatherapeutics.com. NIH, the nation’s medical research agency, includes 27 Institutes and Centers and is a component of the U.S. Department of Health and Human Services. NIH is the primary federal agency conducting and supporting basic, clinical, and translational medical research, and is investigating the causes, treatments, and cures for both common and rare diseases. The National Heart, Lung, and Blood Institute is one of the specific institutions under the NIH umbrella. For more information about NIH and its programs, visit www.nih.gov.